The front end component of Portessa™ Portal Builder is a WordPress plugin which adds tools to design forms or free-form pages with integrated data elements. 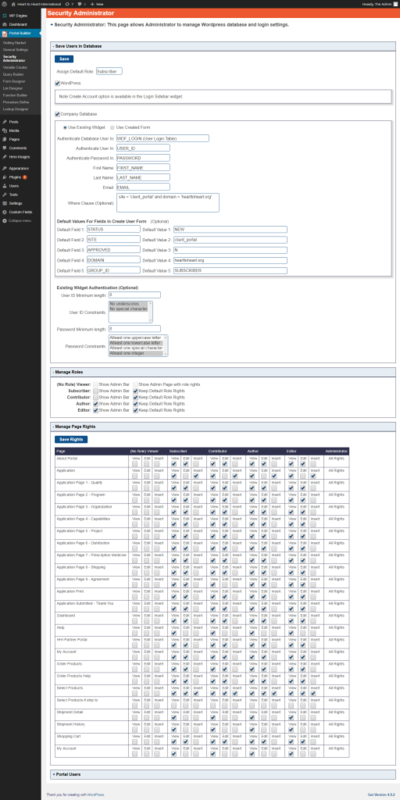 The form page builder gives you that ability to link one or more data tables, design forms that support displaying, editing, validation, and inserting of data to your host system. The free-form page builder gives the ability to access data elements from your tables in individual shortcodes that can be placed anywhere on your pages. More advanced features include the ability to add actions and buttons to recall, save, insert data, as well as call host API functions, make SQL queries, and call stored procedures. 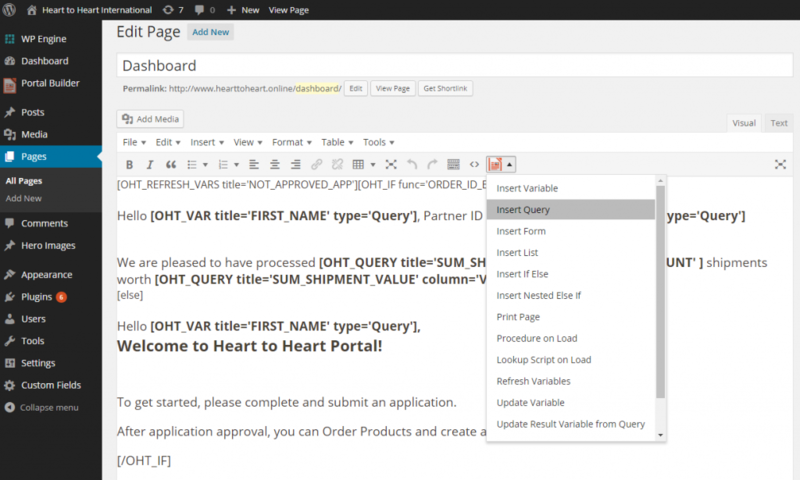 The Query Builder component is the core component. 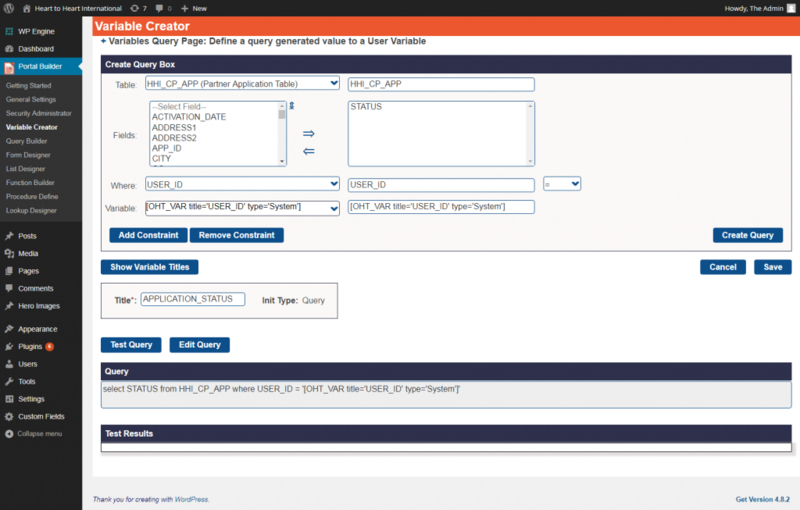 This tool guides you through creating SQL queries to access your data. The data can be easily used in forms, or dropped directly into WordPress pages. The Query Builder prompts selecting data from tables and columns in the database, add conditions, limits, and gives a preview of the results. More advanced users, can embed variables into queries or modify the SQL statements directly. The Test option can preview results. 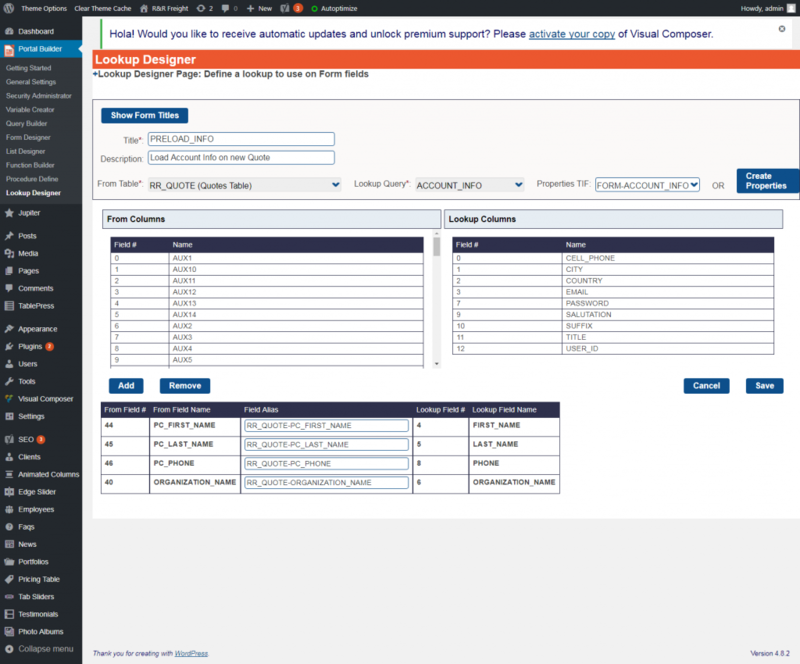 Form Builder allows you to drag and drop any fields from a database table or query and arrange them in an organized snap-to grid layout. Properties and formatting of each field may be controlled in detail. For fields that are set to allow data input, a full list of validation options are available to clean and verify data. 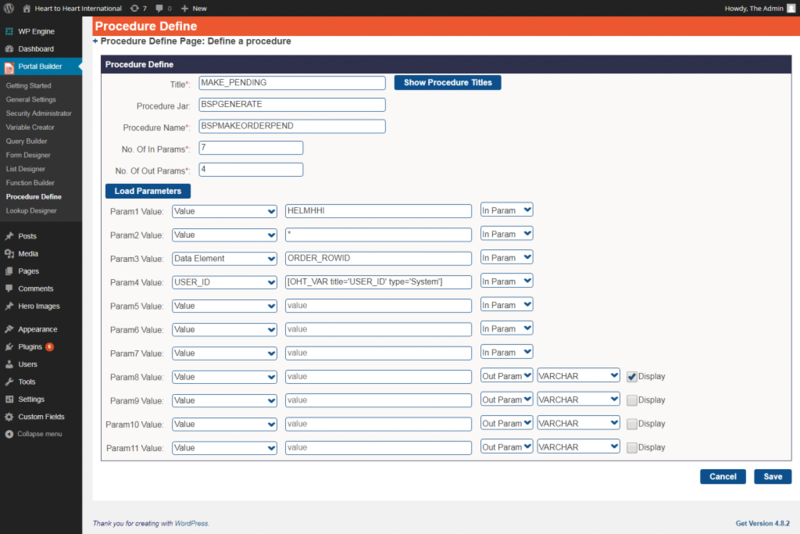 The form as a whole and/or individual field may be set to allow insert, update, or view only access. Other objects such as buttons, images, and links may be easily dropped in the forms. List Builder allows you to drag and drop any fields from a database table or query and place them in a horizontal or vertical list. Properties and formatting of each column may be controlled in detail. The list, and/or individual columns in the list may be set to allow insert, update, or view only access. Columns may include special object such as buttons, images, or links. 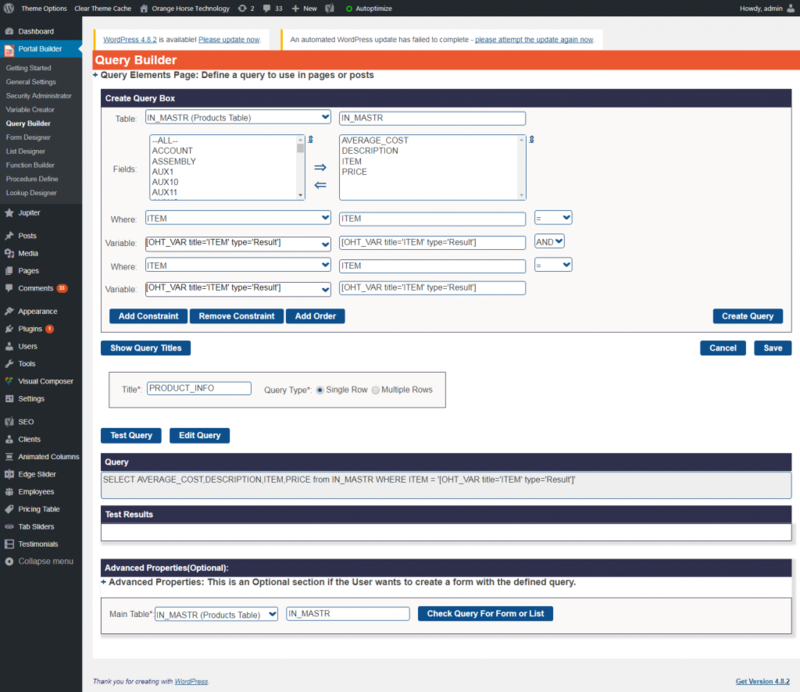 Security Administrator component gives robust control of user authentication, roles, page access, and data manipulation rights through its Security Administrator tool. With these enhanced capabilities you can controlthe default roles for existing or newly created users. 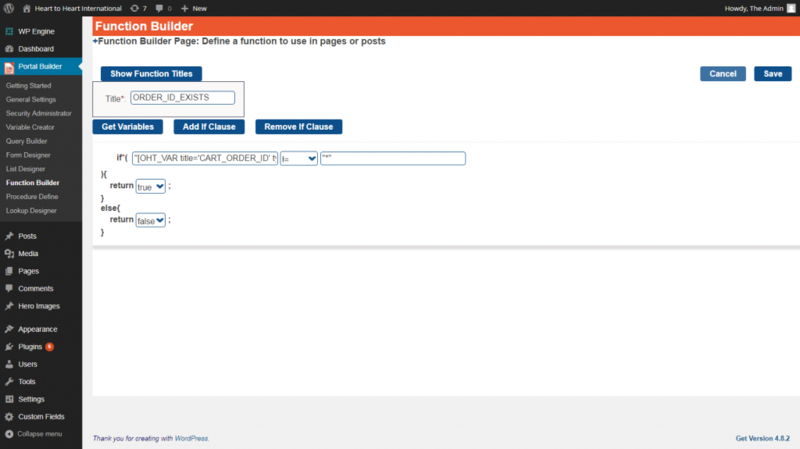 Enhanced roles control what menus and pages users will see and may access, andwhat data or actions a user may access within a page. The Variable Creator component can initialize and load important data. Three types of variables that you may access in your sessions. 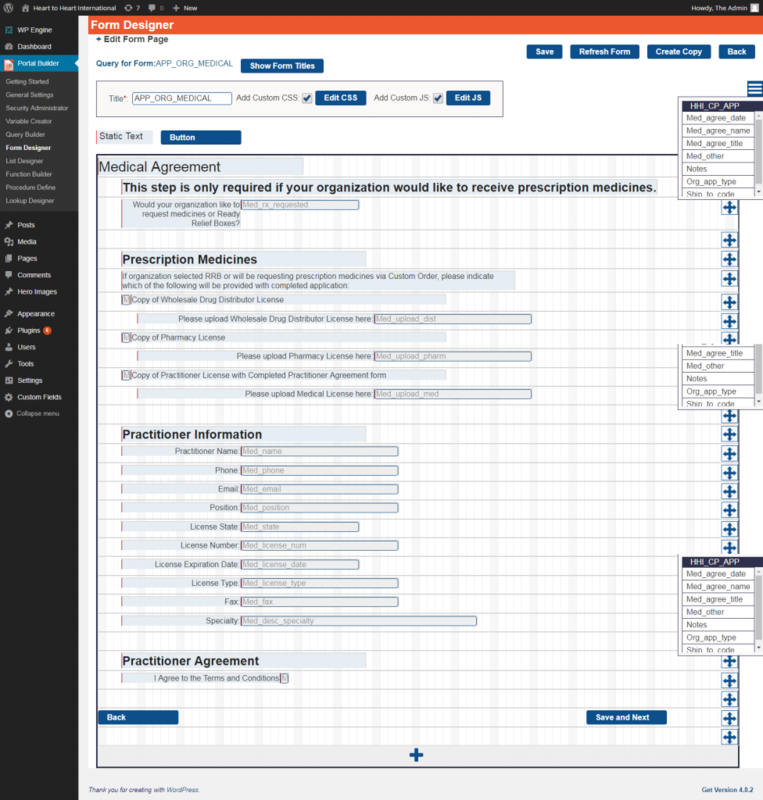 Function Builder allows you to define real-time examination, calculation or conversion of data while a page is being rendered. 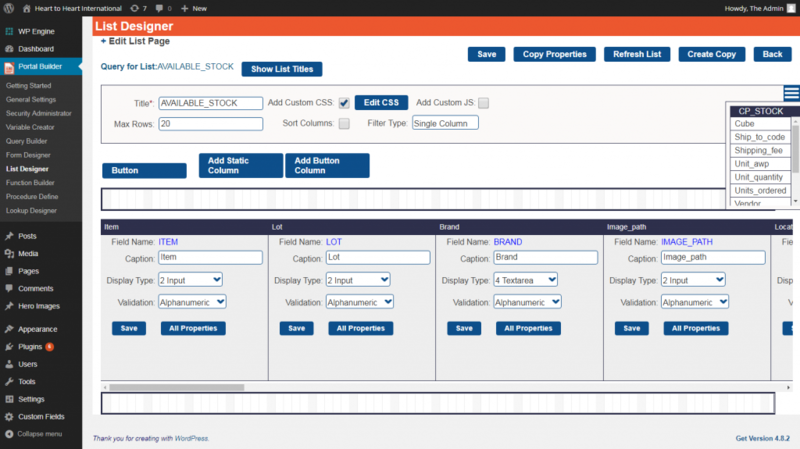 Functions can also be used to test data and change page logic or content on the fly based on the data encountered. Stored Procedures are powerful routines many database systems have to perform specific tasks. The Stored Procedure Definer allows mapping an object or action on a page (like clicking a button) to calling a specific stored procedure in your database. The Definer maps what data may be captured from the page and passed to the procedure, and how to handle returned results or error messages. Lookup Designer gives you the power to create data lookups from one table to another. This tool guides you through selecting data columns and formats from one table, and mapping them into another. This allows you to build lookups and dropdowns on your fields and forms that let users select from lists of live data, and retrieve one or many fields into the current record they are editing. Custom Shortcodes and advanced page editor options offer a many additional options for embedding live data and logic in your pages. Data may be embedded anywhere in your content, and can be formatted just like any other page content. A powerful and secure low-code development platform with the ease and flexibility of WordPress and enterprise level data integration. Copyright © 2017 Orange Horse Technology. All Rights Reserved.